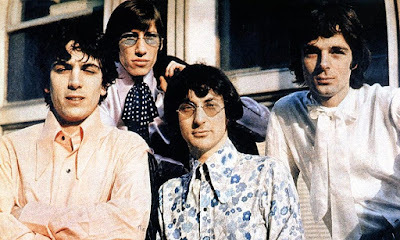 Pink Floyd are streaming rare video of a 1967 performance of “Interstellar Overdrive” originally broadcast on the Granada TV program “Scene – Underground”, as a preview to the March 24 release of a series of individual volumes from “The Early Years 1965-1972” box set. The band were filmed in concert at The UFO Club in London, UK on January 27, 1967 for the pop culture show; the track would appear on their groundbreaking debut album, “The Piper At The Gates Of Dawn”, a little over six months later. Issued last November, “The Early Years 1965-1972” box set presented 27-discs featuring 130 tracks from the band’s formative years, including TV recordings, BBC Sessions, outtakes and demos and more than 20 unreleased songs. Also featured were 7 hours of previously unreleased live audio and more than 5 hours of rare concert footage. Pink Floyd are now set to release 6 individual volumes from the package, breaking down the massive project into bite-sized volumes by years – from the mid-1960s start with original member Syd Barrett to the growth shown by 1972 as the band prepared to record “The Dark Side Of The Moon” album. In addition to the six releases, a 2-CD highlights album, “The Early Years – Cre/ation”, is also available. Pink Floyd released their final album, “The Endless River”, in 2014. The project featured material recorded by David Gilmour, Richard Wright and Nick Mason during sessions for 1994’s “The Division Bell.” The album also served as a tribute to Wright, who died from cancer in 2008 at the age of 65.